The only proposed MSR concept currently being seriously pursued is the Fuji MSR, or more specifically the mini-Fuji MSR, which aims to build a 10 MWe prototype. Its design proves a lot of the points I’ve been making as I was going along. It is contained within a large concrete containment building (presumably to contain the fire risk I mentioned). It uses a secondary cooling loop, likely water cooled. 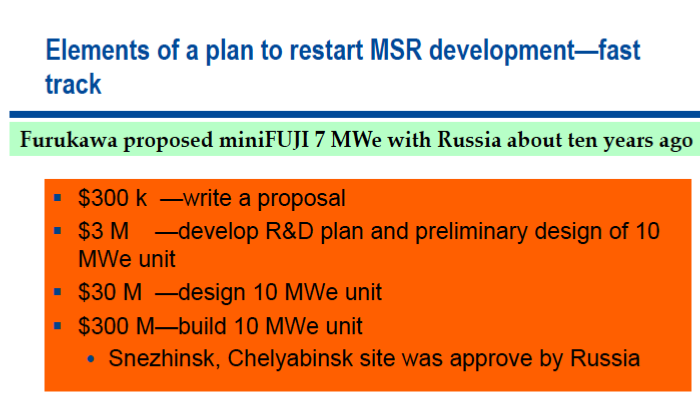 There is little mention of any filtering plant (it is discussed as an option for the larger follow on plant), suggesting they’ve gone for the minimum possible filtration to keep the reactor going and will periodically flush and dump the fuel in the core. It also seems they plant to initially run on UF4, and will explore Thorium use later. Also, there appears to be a funding issue, as very little new information about progress on this project has come available since 2008, suggesting the project has either stalled for some technical reason…. or because someone in authority questioned the logic of a R&D (plus design) budget of just $33 million (that won’t pay for the coffee!) for a reactor that will cost $300 million to construct! Even despite these delusions, given the micro-Fuji MSR’s tiny 10 MWe power output that works out at $30,000 per installed kW! or about 6 times the current install cost of PV and 25 times the installation cost of wind energy! Now granted, it’s a prototype reactor, we’d expect costs to be high, but this is higher than the $24,000/kW price paid by the Japanese for the Monju Fast Reactor, which is generally seen as a white elephant! And of course, the Japanese originally said that Monju would cost a lot less than it did – anyone want to take bets on the micro-Fuji MSR coming in substantially over budget?….assuming of course it ever actually gets built! 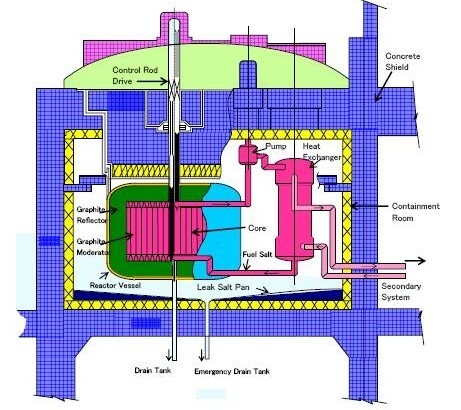 Even if a production version of a LF reactor could be scaled up and built for ¼ of the installed kW costs of the Fuji MSR, LFTR’s would still be much more expensive than existing LWR’s (roughly 2 to 6 more expensive depending on who you ask…the fan boy’s would have you believe they would be half the cost of LWR’s…so they’re numbers are off by a factor of 4 to 12!). And indeed LTFR’s would still have installation costs 1.5 times more expensive than PV and over 6 times the price of wind energy, and of course we still have to decommission them, and the current decom costs for graphite cored reactors are high, between $2,600-6,800 per kW. While the final installation costs of the other reactors we’ve reviewed are “up in the air” somewhat, I doubt any of them, with the possible exception of the GcFR, would be this expensive.